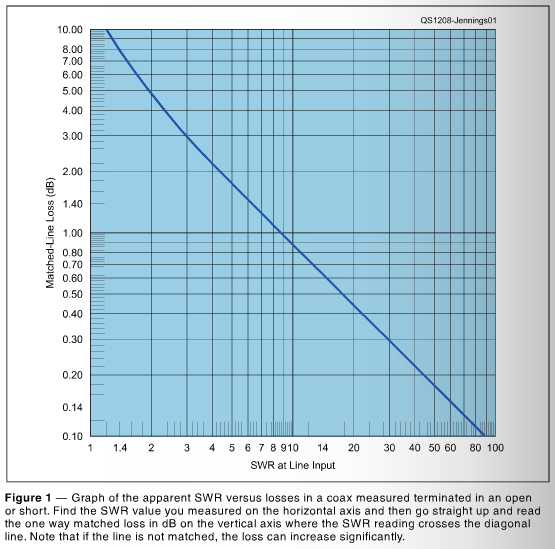 A technique often proposed for measuring loss of a transmission line section is to measure the input VSWR or the Return Loss of the section of line with either a short circuit (s/c) or open circuit (s/c) at the far end, and from the Return Loss, calculate the Matched Line Loss (MLL). It is based on the notion that the forward wave incurs loss equal to the MLL in travelling from source to far end, and that the reflected wave which is equal to 100% or -100% of the forward wave at the o/c or s/c termination also in travelling back to the source. It is though, a flawed application of the notion of Matched Line Loss. Nevertheless, it is a popular proposition. (Bird 2004) gives the following advice. Line loss using open circuit calibration: The high directivity of elements can be exploited in line loss measurements, because of the equality of forward and reflected power with the load connector open or short circuited. In this state the forward and reflected waves have equal power, so that φ = 100% and ρ = ∞. Open circuit testing is preferred to short circuit, because a high quality open circuit is easier to create than a high quality short. To measure insertion loss, use a high quality open circuit to check forward and reverse power equality, then connect an open-circuited, unknown line to the wattmeter. The measured φ is the attenuation for two passes along the line (down and back). The attenuation can then be compared with published data for line type and length (remember to halve Ndb or double the line length to account for the measurement technique). This also contains the hoary old chestnut that a good o/c termination is hard to achieve, but this author's experience of measurement with modern VNAs is not consistent with Bird's assertion. Bird's explanation applies the 'one way loss' or MLL to each wave separately. (Jennings 2012) describes a method based on the same assumptions, and offers a graph that relates input VSWR to MLL. Whatever signal power we put into one end will arrive at the other end with the same power less the amount of line loss. Because the short or open at the other end provides a total reflection, the signal then reverses its direction and returns to the source end. On the return trip, the power level at the far end of the coax will again be reduced by the losses in the coax. It is a pretty loose description, but it is clear that Jennings is applying the MLL separately to each travelling wave component yet the loss is the result of summing the loss due to the currents and voltages at every point along the line, and those currents and voltages are due to the phasor sum of the travelling wave components vary along the line when there are standing waves due to mismatch (ie VSWR>1). the usually unstated underlying assumption that loss under mismatch is uniform along the transmission line section. This article discusses Return Loss which can be readily calculated from VSWR as ReturnLoss=-20*log((VSWR-1)/(VSWR+1))dB. For example, if VSWR=3, ReturnLoss=-20*log((3-1)/(3+1))=6dB. Jenning's assertion is that if that VSWR resulted from a s/c or o/c line section, then MLL=ReturnLoss/2=3dB which reconciles with Jenning's graph in Fig 1. Uncertainty in measurement leads to uncertainty in the calculated Return Loss. That said, the simple methods that are commonly applied to analysis of uncertainty overestimate the uncertainty. For example, Bird quote the accuracy of their 43 series wattmeter as ±5% of Full Scale Deflection (FSD), so that lets say forward power was measured on a 100W scale at 80W and reflected power at 60W, the correct Return Loss could be though of as ranging from 85W/55W (Return Loss 1.9dB) to 75W/65W (Return Loss 0.6dB). The reality is that some factors that contribute to the uncertainty quoted by Bird are common to both of the measurements, and blind application of absolute error of 5% of FSD to each measurement overestimates uncertainty of the calculated Return Loss. Measurement of larger power ratios may be affected by directivity of the coupler, or the calibration of a second element used in the measurements. (Jennings 2012) gives a measurement example and shows the results on an MFJ269 analyser. The MFJ269 displays R=29, X=72 and VSWR=6.6. These are inconsistent, VSWR(50)=5.7 for R and X shown, so if R and X were correct, HRL=1.53dB, 14% higher than for the VSWR=6.6 case. As Jennings notes, these instruments have accuracy issues. Measurement uncertainty is an issue though, especially for scenarios where the two measurements are nearly equal, and the result becomes very sensitive to uncertainty of each measurement. Another significant source of measurement error is that Return Loss is measured wrt characteristic impedance different to that of the actual cable under measurement. Instruments measure Return Loss in the conext of some calibration characteristic impedance Zo. There can be error due to the accuracy of that calibration, but more significantly at HF and below is the that Zo of practical RF cab;es departs from their nominal Zo. 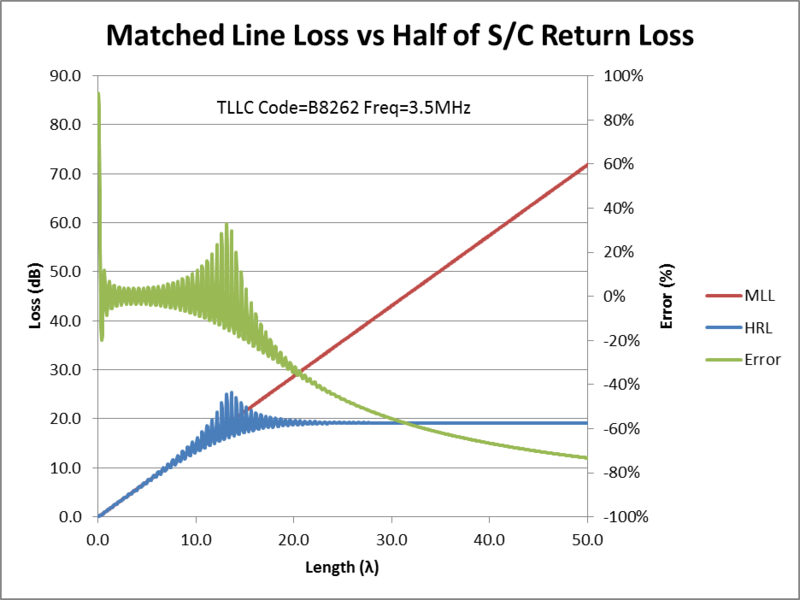 Fig 2 shows the nominal MLL for a range of lengths of Belden 8262 (RG58C/U) at 3.5MHz. Note that it is a straight line, Loss(length)=MLL*length. 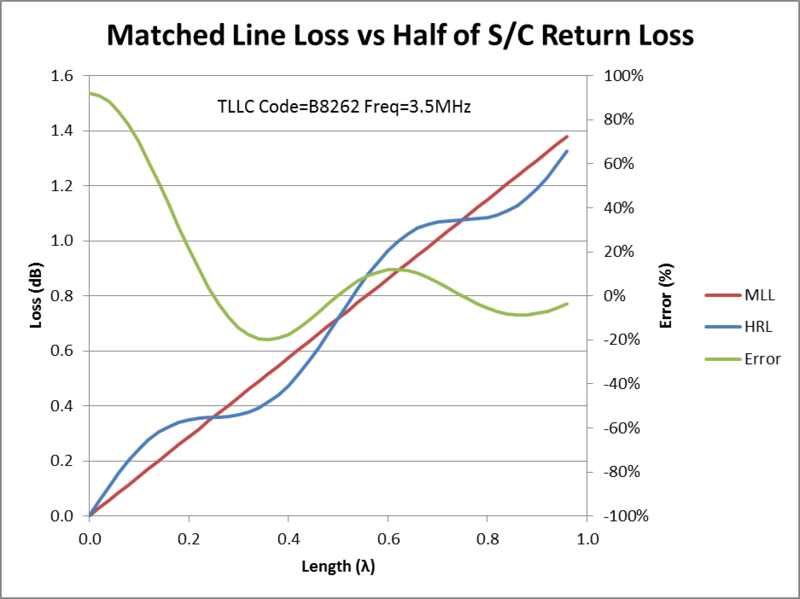 Fig 2 also shows the quantity Half Return Loss (HRL) calculated wrt Zo=50+j0Ω for a line section terminated in a s/c. Note that it is not a straight line, the error is entirely due to the actual Zo (which is a complex value that is frequency dependent) and the assumed or isntrument Zo. Fig 2 also shows the error between calculated HRL and the actual MLL, it is quite large for some line lengths. Fig 3 shows the same information for the same line section terminated in an o/c at the far end. Again, there are large errors at some line lengths for exactly the same reasons discussed above. This might be seen as a problem that only occurs at quite short line lengths, and goes away for longer lines. Fig 4 shows the same scenario to much greater line lengths. It can be seen that error is moderately low between about 2λ and 10λ, but it grows again for longer lengths. The effect is highly dependent on cable MLL and frequency so it is not possible to develop simple but accurate rules for bounds on accuracy of this method, it is potentially unreliable. For practical low loss lines and where the error in Zo is very small (such as in the example above), a reasonably good approximation exists. ρ can be calculated from ReturnLoss in dB as ρ=10^(RL/20), and so MLL=(RLsc*RLoc)/4 where MLL and RL are in dB. 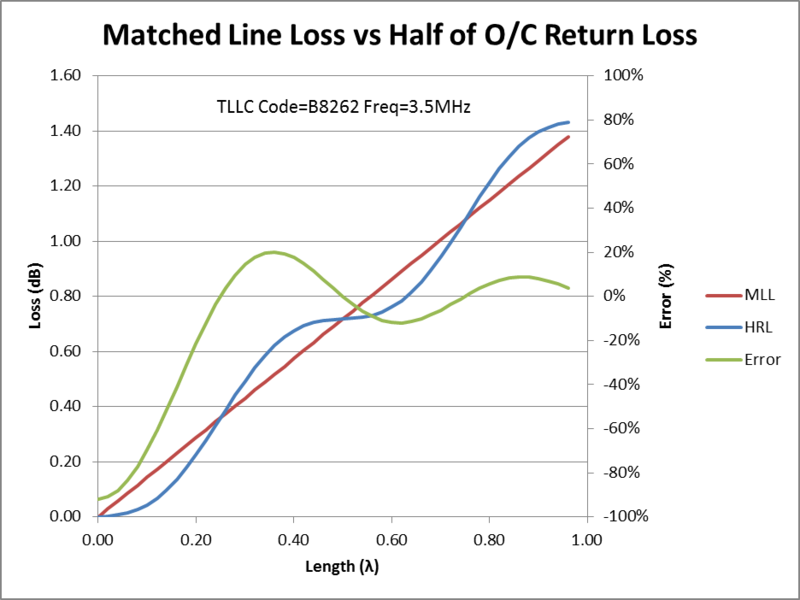 The method of estimating Matched Line Loss from Half Return Loss for an o/c or s/c line section is unreliable, whilst it might seem to work for some lines, some lengths at some frequencies, it is not accurate in the general case. The method is very sensitive to measurement uncertainty in the case of low loss line sections. The method is very sensitive to Zo error in actual line sections. MLL can be approximated as MLL-5log(ρsc*ρoc) or MLL≈(RLsc*RLoc)/4, subject to the accuracy of each ρ or RL measurement, and the Zo error is very small. Bird Electronic Corporation. 2004. RF directional thruline wattmeter model 43 - instruction book. Cleveland: Bird Electronic Corporation. p14.